In the last two posts about implementing GridView in ASP.NET MVC, we talked about how we can create a grid like we had in ASP.NET webforms using JQuery DataTables plug in, then in the second post, we saw how we can enhance the performance of our gird by implementing the sorting, searching and paging, as in the first post we implemented a gird but the problem was all rows were getting rendered on the page as HTML when page is first time loaded and filtering, paging and sorting was being done on the client side and handled by the datatables plug in. I hope that after reading the previous posts on grid in ASP.NET MVC, you are now in a better position to create a grid view in ASP.NET MVC which for most beginners is a difficult thing, especially for those who come from the webforms development experience. 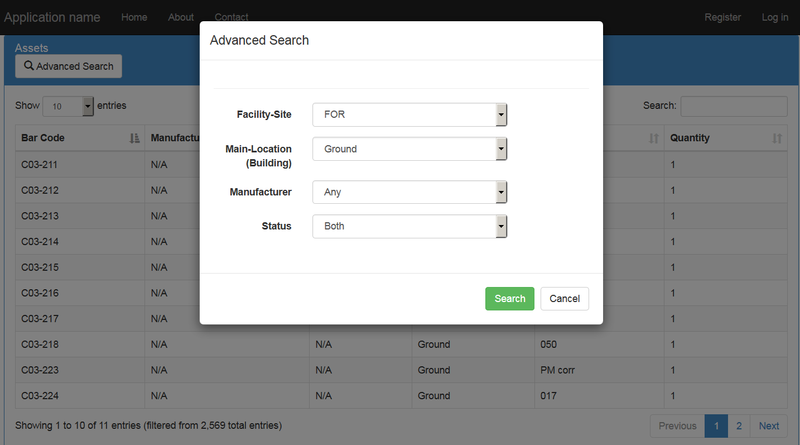 In this post, we will see that how we can add Advanced Search on our GridView, so that user gets more user friendly search experience while searching for data in the grid. We won't be repeating the steps from the previous one which we have done already which includes database creation and inserting sample data, setting up a new web application project with the required nuget packages, if you are directly reading this, you might want to take a look at least at the last post about server side filtering to get familiar with what we are doing, so as said, we will be reusing the same project and code and will continue adding the new portion to it. We saw in previous posts that we had just one Assets table that we were using to display records in the Grid and we had all the data in just one table in de-normalized form, so we have normalized one of the columns of Assets table and created a Lookup table named FacilitySites to demonstrate how advanced search can be implemented using datatables on server side, normalization is also done mostly to avoid data duplication so that instead of repeating the same value in multiple rows, we store it as a row in another table and just reference the unique identifier in the other table. 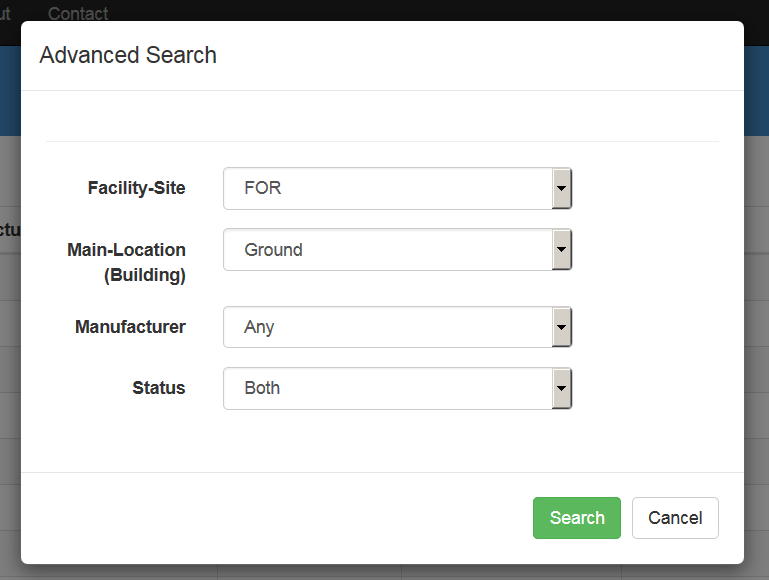 We will create a new view for our advanced search, which will contain a form with few input HTML controls that will be posted to controller action for filtering the records. If you note, we have some new attributes in the button code, you don't need to worry that those are for bootstrap modal, as clicking the button will open a Modal dialog, and user would be able to select the search criteria and search for results. The data-toggle="modal" attribute dictates that this button will toggle a Modal Dialog and data-target="#advancedSearchModal" specifies the HTML element of the page which would be displayed as Modal Dialog. Our AdvancedSearch post action will be almost the same implementation wise as was the implementation of Search action for Server Side Sort, Filter and Paging one, but there will be a small change in action signatures for AdvancedSearch, it will now take 2 parameters which is quite obvious, one for maintaining the DataTables state which was already there before as well and the new one will be the instance of AdvancedSearchViewModel class which will have the state of controls of Advanced Search Modal popup. Now, we will move towards the view part, as you can see, we have last four properties of type SelectList which are there because we will have few dropdown list controls in the advanced form which user will be selecting from pre-populated values for searching the records. You can see above that we have added a new function in our datatable view model named refresh, whose purpose is to reload the datatable from server side using the model of DataTables, we have written the event handler for Advanced Search Popup button that when it is pressed, it causes the datatable to be reloaded and in the Ajax call of it, we are passing the user selected search criteria from advanced search view as well using that data property of jQuery datatables. 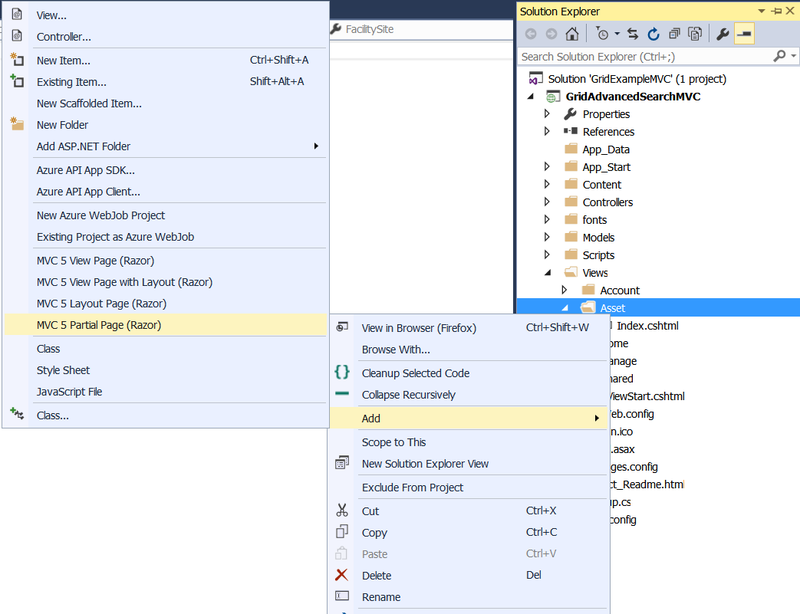 Now build the project, and run it in browser to see the working server side Advanced Search using JQuery datatables and with server side filtering, paging, and sorting as well in action. Ehsan Sajjad is a Microsoft Certified Professional, Microsoft Certified C# Specialist and he is also among the top users on StackOverflow from Pakistan with 50k+ reputation at time of writing this and counting. He is a passionate software developer with around 5 years of professional experience in Microsoft Technologies both web and desktop applications and always open to learn new things and platforms especially in mobile application development and game development. Is Html.BeginForm in _AdvancedSearchPartial.cshmt really needed ? Is Html.BeginForm in _AdvancedSearchPartial.cshmt needed ? I remove it and it's still working. Thanks. Becasue i want to add a checkbox column,i change the columns definiation of the datatables to "columndefs",but it doesn't work.The information is query string is too long. May I know why I cannot run this statement in AssetController.cs? Ur help is very much appreciate. Have you configured the connection string correct in web.config ? change to computer name, it is working great now. Please, put your article in correctly tag and fix the code formation in your article! There is something wrong, when we go to update the article the area of article text is displaying empty and is not editable. I have the same problem with FF, so I'm using the Edge to edit my articles! unfortunately i am not using Windows 10, i tried with both chrome and Firefox but it is not working. Try to disable the Adblock or some other ads. block!